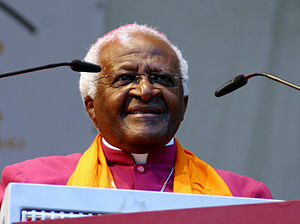 Retired Anglican Bishop Desmond Tutu has written a most fascinating book, God is Not a Christian: And Other Provocations,” which begs any and all who take their religious walk and life seriously to read. Those words are simple; the directive of the Gospel to love God with everything we’ve got, and our neighbors as ourselves is a simple one to understand, and yet, is most difficult to do. What comes to mind immediately is the poor reception a 10-year-old Mexican American boy got when he sang the National Anthem at the opening of Game 3 of the championship game last week between the San Antonio Spurs and the Miami Heat in San Antonio. Sebastien De La Cruz sang his little heart out at the opening game…but instead of encouraging and supporting him, some people found the fact of his singing the National Anthem offensive. (http://www.cnn.com/2013/06/12/us/mexican-american-boy-sings-anthem/index.html) . Cryptic and racist remarks were made, like, “Why do they have a Mexican singing the National Anthem?” or “why are they letting an illegal alien sing the national anthem?” (De La Cruz, by the way, is an American citizen.) Apparently, there were a lot of such remarks made, and I would bet that many of them were made by God-fearing, God-loving Americans. There is something wrong with a country that applauds globalization from an economic perspective, but which does not understand all of the ways globalization changes and is changing the world. To be global means to be connected with people not like yourself; it means that different music, different names, different foods, different customs …become available for all people. Instead of being a homogeneous society, globalization means that there is a buffet before people, offering the great diversity of this world…which was, remember, all created by God. globalization means that sometimes, as ethnic and racial groups meet, people will be uncomfortable as they come face to face with that which is different. We grow to love the “safe sameness” that Tutu writes about, and anything that jostles that safety is enough to set some people off, God notwithstanding. Christians are held to a high standard because Christians claim to follow Jesus the Christ, who preached love, inclusiveness, compassion, mercy and forgiveness. Christians like to boast that “their way” is the “only way” to God. But one has to wonder, as we watch Christians behave abominably, what God is saying. Could it be that God is displeased with our racism and sexism and homophobia and xenophobia? Could it be that God is shaking at His/Her very foundations, yelling and screaming, “No!!! That’s not what I sent Jesus for!” as He/She watches us shun people, put them out of our “safe sameness” and as far away from us as possible? Did God waste the sacrifice of his Son? Was Jesus’ suffering and death done for nothing? It may not be hurting De La Cruz, but one wonders if it hurts God. The days are over when America looks one way, with two major ethnic groups facing off. The fabric of America is multi-colored, with different hues and shades that will only increase. One day there may well be a Muslim in a hajib singing the National Anthem. Globalization, as far as the business community is concerned, is a good thing in that it increases the capacity for huge profits based on expanding markets. But globalization at its core might more importantly be about bringing the diversity of this world together, so that we must come out of “safe sameness” and get to know our neighbors better. It will be much harder to war against people we have grown to know and love.